While visiting The Beach House Suites at Loews Don CeSar a few weeks ago, we had the opportunity to check out the brand new Rowe Bar located inside of Loews Don CeSar. The Rowe Bar was part of a $10 million renovation that recently happened at the Pink Palace and I can say, it is a wonderful addition to the resort. The Rowe Bar, named after the hotel’s developer Thomas Rowe, specializes in hand-crafted cocktails, craft beer and coastal cuisine. Rowe Bars specialty is three variations of the Julep and we had an opportunity to try two of them - the Gin Julep (Hendricks, St. Germain, Grapefruit and Arugula) and the Tequila Julep (Corazon Blanco, Chartreuse, Bell Pepper, Cilantro). They were served in a traditional Julep glass and were quite delicious. Many of the cocktails from the Drink Menu were popular in the 1920's, each with a story behind it. We sampled other craft cocktails such as the Anytime Rickey (Beefeater Gin, Aquavit, Orange Marmalade, Lime Juice); Angels on Toast (St. Pete Vodka, Kiwi, Sauvignon Blanc, Lime Juice), Rest & Recuperation (Bulleit Rye, IPA, Lemon Juice). All cocktails were vastly different from the next and were full of flavor. We witnessed a stunning sunset shortly after receiving our cocktails. The Rowe Bar offers patrons an indoor and outdoor environments. Inside, guests experience a subtle nautical feel. Outside sits a St. Pete Beach sunset lover’s paradise as shown in the video below. The outdoor space is anchored by a long linear fireplace that stretches across the porch, and leads to a raised deck where guests can relax at one of the three raised fire pits. We also got to try the majority of the Bites Menu during our two night stay. During our first night, we had a cocktail hour and sampled East and West Coast Oysters, Beef Carpacio and a Meat & Cheese plate. We had dinner later that night at Maritana Grille so we couldn't pig out too much. After seeing the Wagyu Burger on the menu, we quickly made plans to eat dinner at Rowe Bar the following evening. The Wagyu burger featured white cheddar cheese, sriracha bacon, crispy onions and french fries with bleu cheese. Delicious! Since there were four of us, we ordered a few things and shared which is the way I would suggest trying out Rowe Bars offerings, this way you can try a little bit of everything. “I set out to create a beverage menu that would complement the history and character of Loews Don CeSar. There were no blender drinks back in the 20’s; everything was made with crushed ice. That’s what we’re doing in Rowe Bar today. Adding the traditional Julep drink that was popular in the 20’s to the menu just makes the Rowe Bar that more attractive and distinctive” said Klemm. “We’re only using fresh herbs, fruits and vegetables in our cocktails. Each one will have its own refreshing personality and character” he continued. The Rowe Bar is open Sunday - Thursday from 11am-1am and Friday and Saturday from 11am - 2am. Self-parking is available for $10 per car (up to three hours). 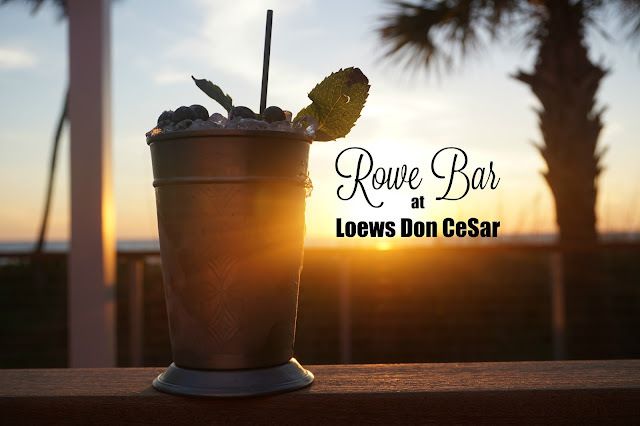 The Rowe Bar at Loews Don CeSar is located at 3400 Gulf Boulevard, St. Pete Beach, FL 33706. Additional information can be found at www.loewshotels.com or call 727-360-1881.